"Wow. I just had the opportunity to try Hacks BBQ Sauce - and both my husband and I love it! We own a catering company in Sugar Grove, Illinois, and we do countless pig roasts every year. We normally serve Sweet Baby Ray's Barbecue sauce with our pork sandwiches, but we've decided to switch to Hacks because we like it better....and we're sure our customers will too." "Just a follow up from our purchase. It has been a joy to have barbecue sauce in the house again. We use it on left over roasts, chicken, and I will especially use it on a lunch meat sandwiches! Thank you for a wonderful product. I have passed the word along." "Wonderfully delicious depth of flavors without onions or peppers. I use Hack's on grilled fish and vegetables too." "Got to try Hack's BBQ Sauce last night. It was phenomenal on grilled chicken - earthy, spicy and thick. Good stuff." "Incredible! We just finished four pieces of chicken marinated and baked in your sauce. Out of this world! Great job. You have a winner!" 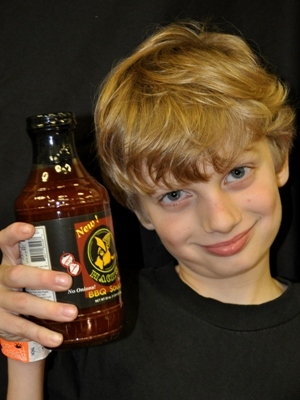 "We broke open the first jar of BBQ Sauce this week and really enjoyed it. The flavor is sharp and tangy and the sauce has a good texture which holds to the meat. We used it with Pork Chops and had a great meal. It's a winner at our house." "I haven't had a chance to grill outside much this summer because of the late afternoon fog and cold, but I did use the barbecue sauce to make Margaret's Meat Loaf recipe, and it was delicious. The sauce had nice, complex flavors, and I'm eager to try it with some other indoor recipes." Doug C.in South San Francisco, CA. "I love a good barbeque, and having the right BBQ sauce is an important part of the grilling experience for me. When I first tried Hack's No Onion BBQ sauce, I was immediately impressed by how tasty it is. Hack's has a rich flavor and thick consistency that makes it perfect for ribs, hamburgers, and meatloaf, and it is great on other meats as well. I will happily continue to use Hack's BBQ sauce and I will give it the highest of recommendations to fellow BBQ enthusiasts anywhere." "I LOVE summer barbeques and the taste of grilled chicken, ribs, and burgers, but I found that I often had problems digesting the popular BBQ sauces. When I read the labels I found that almost every single one had peppers listed among the ingredients. I have a reaction to peppers that makes it very unpleasant when I consume them. When I tried Hacks I was pleasantly surprised by its great flavor and I discovered that I had absolutely no digestive problems afterward. I do love this stuff and my family likes it, too. Go HACKS!" "Being fully capable of enjoying both onions and peppers, Hack's will still always be a staple at my barbeques. You don't need to have dietary problems to love Hack's! Try it and see. I love it on chicken, even in the microwave." "I tried your sauce about a month ago and was very pleased I must say. As for myself, I can eat just about anything that doesn't move, so, neither the onions nor the peppers are a problem for me. But there are a lot of people out there that cannot eat then for health reasons. I will pass this site on to ones that I know that cannot eat onions or peppers. I tried your sauce on some fish, and it was mmm, mmm good, I tried it on pasta, and it was also mmm, mmm good, I tried it on pork chops, loved it. Thank you so much for thinking of others." The "Q" Review reviews all things BBQ - read what they said about Hack's Sweet & Tangy BBQ sauce. Peppers and More tried us over the Labor Day weekend and seemed to really enjoy how thick Hack's is. See what they said! I Be a fooDie Blog - Dedicated to IBD friendly foods. They tried our sauce and couldn't wait to try it again.